On Thursday this week, the European Commission will present its proposed framework programme for research and innovation for the period 2021–2027, currently designated ‘Horizon Europe’. 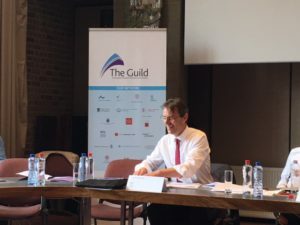 So it was very timely that the Guild held its General Assembly at the beginning of this week, 4–5 June, and that it had invited the Commission’s new Director-General for Research and Innovation, Jean-Eric Paquet, to attend. Together with the other members of the Guild, Uppsala University has argued for a doubling of the EU’s budget for research and education, and many other universities and networks support this demand. The EU framework programmes are important for European universities. They are intended as a strategic tool complementing and reinforcing national actions in the areas of research, education and innovation. When Horizon Europe is presented on Thursday, the process of negotiations will start. We think it is important that education and research are placed to the fore and that the budget is increased. A new member was elected to the Board of Directors of the Guild, Svein Stölen from the University of Oslo. Vincent Blondel, University of Louvain, chairs the Board and I will be vice-chair for another two-year period. Vanessa Debiais-Sainton, from the Directorate-General for Education, Youth, Sport and Culture, was also invited to the Guild meeting. She told us that President Macron’s ideas about European Universities are beginning to take more and more definite shape. Another network to which Uppsala University belongs, U4, has plans to put together an application for the pilot phase of this initiative, together with the University of Tartu. We know that a proposal has been made to double the budget for the Erasmus programmes from the present level and that there are plans pointing towards a reorganisation in Europe that will bring research, education and collaboration into closer contact, which we would welcome. All in all, it was a rewarding meeting with interesting discussions and there is a good climate of cooperation among the 19 universities that are members of the Guild. And it will be interesting to see what the Commission proposes on Thursday. After a cancelled flight from Brussels and then further delays, it feels good to see Uppsala silhouetted against the beautiful night sky and to know I will soon be home. Tomorrow I will be at the National Day celebrations at Skansen.